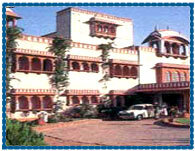 Hotel Jaipur Ashok Jaipur, Jaipur Ashok Hotel Jaipur, Reservation for Hotel Jaipur Ashok, Jaipur, India. Address: Jai Singh Circle, Bani Park, Jaipur - 302016, Rajasthan, India. Accessibility: 14 kms. from Airport, 1 kms. from Railway Station, 1 kms. from Bus Stand. Hotel Jaipur Ashok is located near the railway station, run by the Ashok group of hotels renowned for their warm hospitality and efficient services. Hotel offers the elegance of a small Rajasthani palace like residence fully equipped with all the modern facilities, built in accordance with the ancient Hindu treatise on architecture. 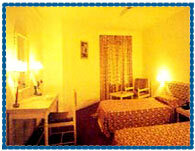 Hotel Jaipur Ashok offers 97 centrally air-conditioned, well appointed double rooms and 2 Suites with attached bathrooms, hot and cold water, TV, and telephone. 24 Hours Room Service, Attached Bath with H/C Running Water, Direct Dialing, Telephone, Fax, C.C.T.V., Safe Deposit, Channel Music, Doctor on Call, Laundry, Money Changer, Banking, Safe Deposit,Valet, Banquet & Conference Facilities.